Most major internet services and social networks claim to be as transparent as possible regarding user privacy, but there are times when legal issues prevent them from doing so. Data requests from the likes of the NSA and FBI in many cases come along with stipulations that stop sites from disclosing details about what and when information is given to the government. 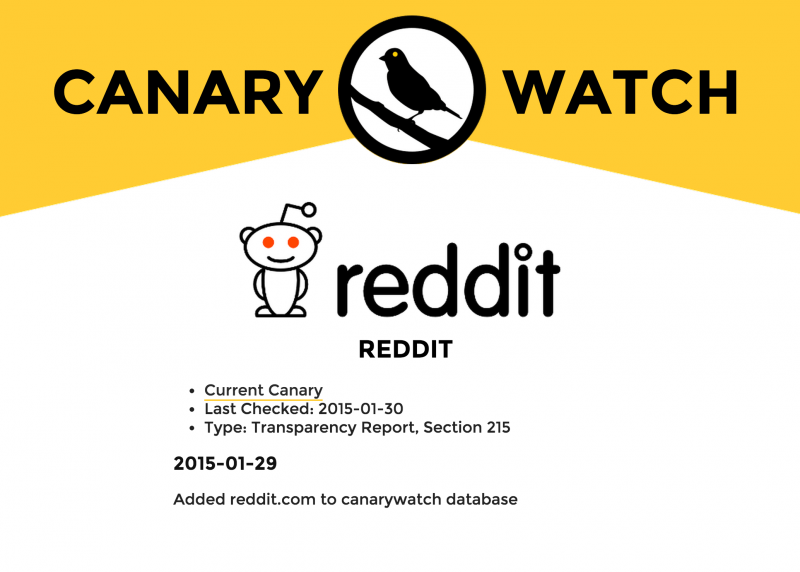 But now a new site known as Canary Watch claims to have figured some of that out. While it is in most cases illegal for a site to say it is receiving a national security data request from the government, it is not illegal for it to say it has not received one. This is how Canary Watch works. By tracking a constant flow of statements from sites saying they have not received a request, it will be able to reveal when a site has received one. An example of a transparency statement or “canary” can be found here for Reddit, and includes information like when a site was last checked (2015-01-30 in this case) among other things. While Canary Watch can know when a service has received a data request, it does not appear to receive any details on what that information is. The service, which was created by the NYU Technology Law & Policy Clinic group known as the Electronic Frontier Foundation (EFF), is currently tracking a series of cloud based services as well as better known sites like Reddit, Pinterest and Tumblr. The EFF was recently quoted as saying canaries help companies to be honest with the public in a legal way, as well as acting as an advocate for user privacy transparency industry wide.